books – Impressions, Perceptions and Views. Ravi is a man in love and he is willing to do anything to be with his beloved, Shaheen. In his case, the roadblock is not just they are from two different communities; Shaheen stays in Pakistan, whereas Ravi is from Delhi. They had met as children when their families lived in Bahrain as neighbours. He fell in love with Shaheen, his sister Simran’s best friend, when he was in his teens, and his love was reciprocated. But life is often a difficult road and they get separated, as circumstances force Shaheen to return to her homeland, and Ravi settles down in Delhi. This is the story of The Chenab Connection, the latest work of Brigadier (retd) Baqir Shameem, who served in the Indian Army for three decades and witnessed the growing Indo-Pak conflict from close quarters, In this love story, with several twists and turns, he explores the possibilities of an Indian boy and a Pakistani girl falling in love and managing to settle down, having a family, under the looming shadow of hatred that has grown stronger over the last seven decades. The story penned by Brigadier Shameem is a work of fiction; it looks at the crisis and its nuances through the eyes of people who are in love, for the beloved, for parents, for siblings, and for the country of one’s birth, because sometimes all it takes is love to conquer all. In the case of Ravi, love makes him cross one of the most hostile borders in the world to be one with Shaheen. Then there is Simran, and Omar, who fall in love under different circumstances and survive difficult situations to find happiness. 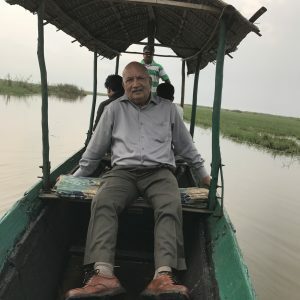 The Chenab Connection is as much a love story as much as it is a look at the divisive politics that has plagued the subcontinent for decades, where terror and subversion have become second nature for hawks, who find more comfort in conflict than in peace and harmony. The novel explores a popular and an intriguing common belief that a wishbone makes your wishes come true. Does this really happen or is it like any other fable that delight the unwary and the gullible? Is there a price to be paid in case the wish does come true ? The novel is about about everyday people living a normal life. The story revolves around four young women, an American, a Latino American, a Punjabi Indian American and an Indian from Bangaluru. They are great friends and meet regularly in cafes and restaurants in Alexandria, Virginia. They are in their late twenties and three of them are married. Although they remain cheerful, they have many worries and serious personal and family problems. They all are in need of financial help and in an outing in a restaurant they playfully and casually make their wishes through the wishbone. Soon they receive a windfall amounting to millions of dollars from a very peculiar source. They are euphoric and see the beginning of the end of all their problems. Unknown to them grave and deadly danger looms, a harbinger for misery and painful harm to them and their dear ones. The novel is a suspense thriller with the action taking place in the bars and casino of Atlantic City, Virginia towns and the the Capitol Hill, Washington DC. Do the girls succeed in retaining the fortune or do they become victims of a dangerous pursuit? “To succeed in life, you need three things: a wishbone, a backbone and a funny bone” says Reba McEntire, a famous American singer. Do the girls in “The Wishbone” have the bones? Two Federal Agents from the United States of America interrogate the Rajput scion of Barmer about the Rathore Mining Corporation, his family business and about drug trafficking in Barmer, his home in Rajasthan, a few miles away from the international border with Pakistan. Manvender Singh Rathore considers their questions routine, but when news comes of his parents being blown away in a bomb blast in Barmer, things take an unexpected turn. Farid a graduate from an American college returns to his native country Saudi Arabia and establishes a flourishing architectural and construction business. Being a Bedouin he respects and follows the traditions and customs of his tribe. Calamity strikes. Farid loses his precious and cherished ones and also falls prey to the system which treats him in the most ghastly manner. He awakens to the arroganceof barbarity and viciousness prevalent amongst his countrymen. He learns about the convoluted and twisted message imparted by the educational system and the clergy to the younger generation who grow up and become menace and scourage to not only his country but world over, Farid seeks revenge. He seeks to dismantle the very source which is responsible for the evil his countrymen are propogating and spreading. Will Farid succeed? The Slender Trail has the answer. It was a swift and surgical operation. Osama bin Laden and his close aides, totally unaware and in deep slumber, were caught alive. Those who offered resistance were shot down, while the rest were rounded up. In the wee hours of the morning, the patrol had completed its mission. By daybreak, helicopters with backup support had reached the area and within no time the world’s most dangerous and most wanted terrorist was on his way to Islamabad. This is just the beginning. The plot is Machiavellian in concept to solve long-cherished political goals – all so much within the realm of probability. In fact, the whole book reads like contemporary history – so plausible is the setting and developments. With bin Laden in Pakistan’s hand anything is possible.